Intrigue? Disgust? Excitement? The buzz around this week’s recipe for French Fridays with Dorie has included all of the above. Rose from One Expat’s Life has tried to nominate this one several times. I was always wholehearted behind the idea, but when we put it to a vote, the community had other ideas. For January, the FFwD administrators picked the lineup, so I took the opportunity to champion this challenging pick. Personally, I like liver. Well, chicken liver, that is, ground into a paste. Beef liver is another story. In fact, when my parents got married, they made a pact never to cook or serve the nutritious meal of their era, (beef) liver and Brussels sprouts. Everyone, even your own parents, gets a chance to be rebellious in one way or another. It turns out that I’m a big fan of Brussels sprouts, though I could never get behind a piece of beef liver other than to make a batch of dog treats. Yes, I love my dog. 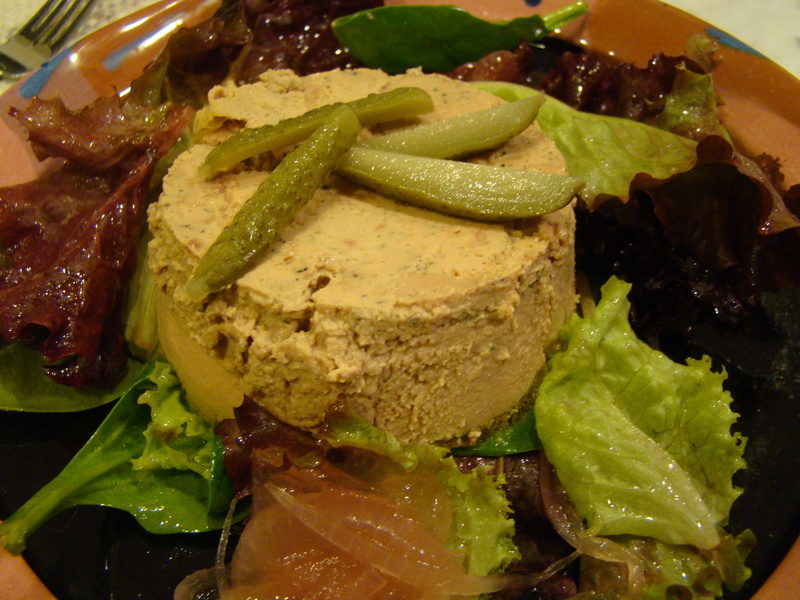 This week’s recipe for chicken liver gâteaux with pickled onions is an elegant starter or lunch. It couldn’t be simpler either. 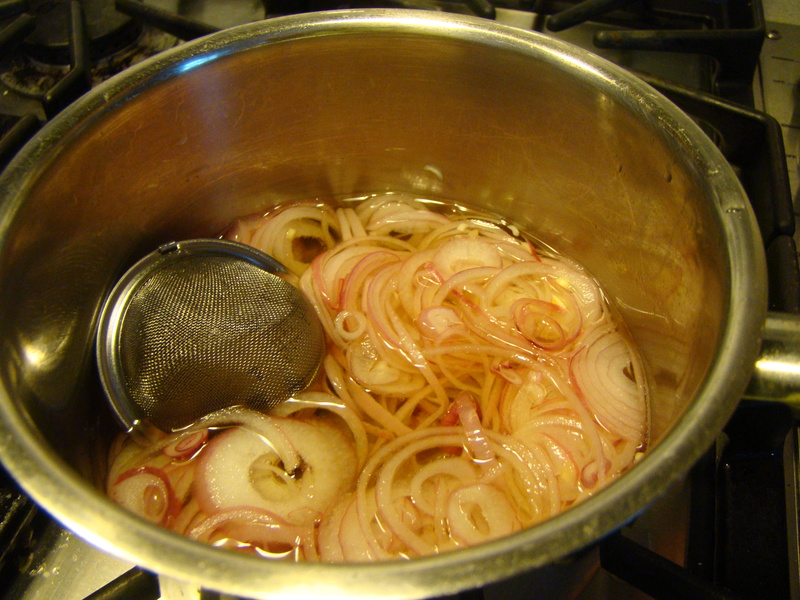 To start, for the pickled onions, you simmer thinly sliced onion in pickling brine for just 10 minutes. I used red onion which gave the brine a slight pink tinge. The spices in the brine were not very noticeable, though the sweet-sour tang of the onions was refreshing. Much more spice is needed. 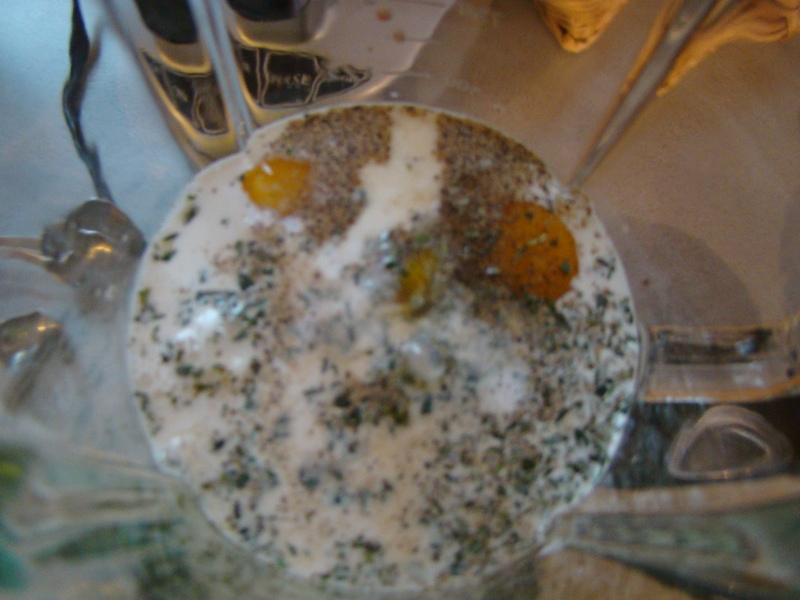 Next, the chicken livers are pureed in a blender along with eggs, egg whites, cream and milk (I used half-and-half), brandy, and herbs. After a couple of minutes, you have a smooth livery mixture. I strained the liquid to eliminate the few remaining lumps. The liver is poured into waiting cups. I tried two different shapes for fun. While the traditional white ramekins were prettier in the cup, the straight sides made them harder to unmold. The ones in the custard cups didn’t look as elegant in the cup, but unmolded more easily and I preferred this shape on the plate. 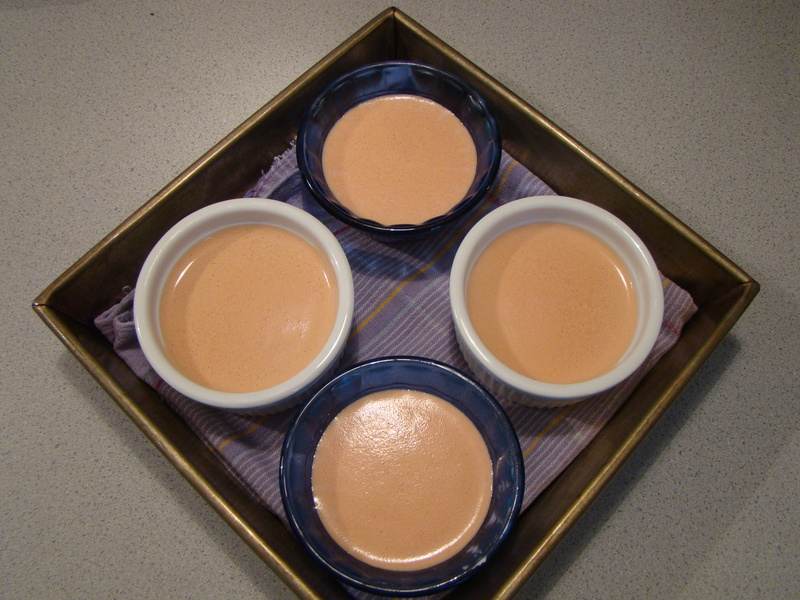 The chicken liver gâteaux are baked in a bain-marie (water bath) for half an hour. They can be eaten warm or cold. I opted to chill them. I tossed some mesclun greens with vinaigrette which served as a bed for the unmolded gâteaux, garnished with pickled onions and, on the suggestion of Mardi from eat.live.travel.write., cornichons. I served this as a first course before dinner, very special for a Wednesday night! And, appropriately, right before I left for my new French language class (more on that later). It was a hit. The texture was wonderfully smooth, a nice contrast to the tang of rest of the dish: the onions, cornichons, and vinaigrette. I would love to serve this to guests, but it would be depend on the adventurousness of their palates. The recipe called for only half a pound of liver, and I made two-thirds the recipe because there are only two of us to eat it. 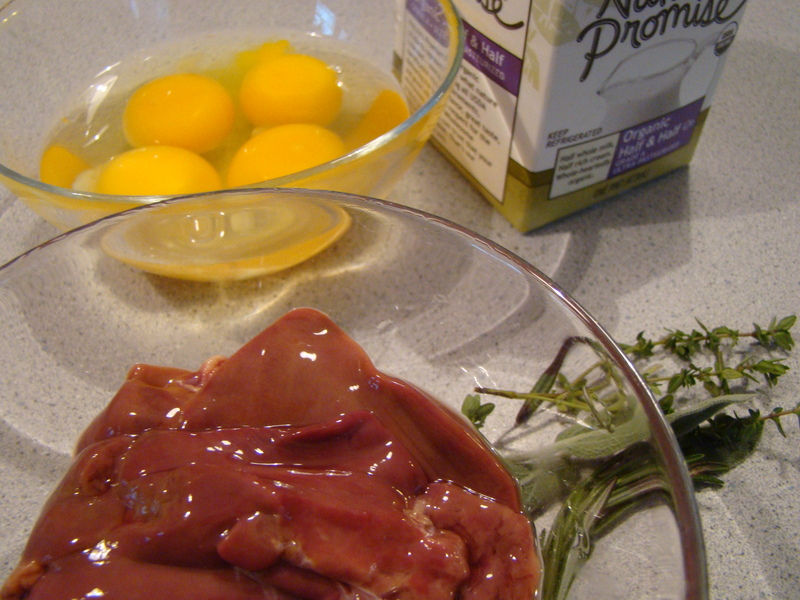 Chicken liver comes in much larger quantity than that, so I made my favorite chopped liver pate with the rest: sauteed onion (in chicken fat is best), grated hard-boiled egg, and cooked chicken livers pulsed in the food processor until well-combined, but not completely smooth. We don’t post the recipes, but you can find it in Dorie Greenspan’s book Around My French Table. And you can read about what the other brave Doristas thought about their own chicken liver adventures here. We’re in liver heaven here in Lexington this week. No anemia here!